call us toll-free at 1-866-672-5533. This site changes regularly, so please stay tuned! The fragrance without the flame. For use in any of your wax warmers. Fill your room with fragrance without having to worry about an open flame. Great for use in Dorm rooms or in homes with young children. 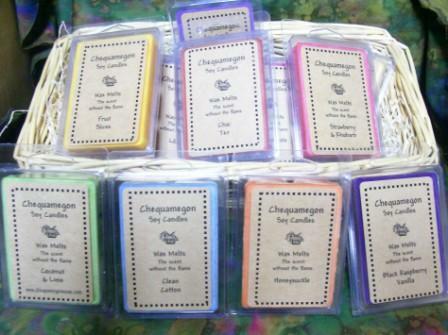 Available in the same bright colors and scents as my 8-oz jar candles and 1-oz travel tins. All Saturdays this season that do not have me at a specific craft event, you can find me in Port Wing at the farmer's market.